Arteric Shares Case Studies with Life Science Leaders, Illustrating Methods to Increase the Relevance and Authority of Brand Content. Summit, NJ, March 14, 2019 --(PR.com)-- Brands are failing to effectively engage their customers. Half of B2C consumers reported that brands could do a better job of engaging them. Irrelevant brand content is a major issue - 51% of B2C consumers and 34% of B2B consumers state that brands send them too much immaterial collateral. Given that 98% of organizations apply a documented, well-defined engagement strategy, these failures indicate that marketers must improve their targeting strategy. These issues were addressed on March 7 at the Future of Customer Engagement, which is part of Arsenal Advisors’ Life Science Leader Summit (LS2) series of conferences. This gathering was held at the Harvard Club, located on the Harvard Medical School campus. Attendees included marketing executives from device, pharmaceutical, and biotechnology companies. The thought leaders who executed the conference’s agenda included Arteric President and Chief Strategist Hans Kaspersetz, who shared how Arteric leverages AI to identify unmet audience needs and other insights that are invisible to conventional market research. In his presentation “AI — Super Hearing for Healthcare Marketers. 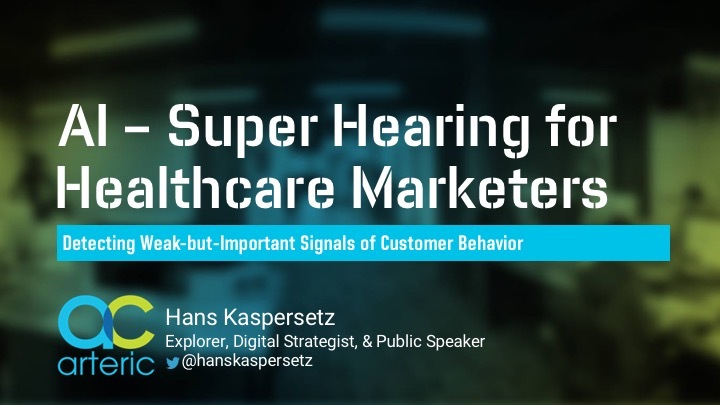 Detecting Weak-but-Important Signals of Customer Behavior,” Mr. Kaspersetz discussed the evolving digital challenges that marketers face while sharing anecdotes from his exploration projects and the results from the practical applications of AI in 2 case studies. The first case study describes how a blockbuster prescription brand uncovered multiple opportunities to more effectively connect with its target audience and tell a richer story. As a result, organic growth increased 202% year over year. In the second case study, AI-analysis of more than 250,000 customer searches enabled a leading OTC cold, cough, and allergy brand to identify a new audience demographic. The insights contributed to the brand exceeding its business goals for 2 years running. For 2 decades, Arteric has helped pharmaceutical brands, biotechnology brands, and medical device manufacturers transform leading-edge technology into competitive advantage. 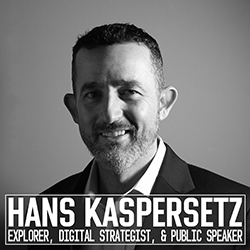 Contact Hans Kaspersetz at 201.546.9910 to advance your brand with personalized marketing solutions that work everywhere, every time. [1.] The State of Engagement. 2017. San Mateo, CA: Marketo. https://www.marketo.com/analyst-and-other-reports/the-state-of-engagement.